WASHINGTON – U.S. Housing and Urban Development (HUD) Secretary Julián Castro, U.S. Secretary of Veterans Affairs (VA) Robert A. McDonald and District of Columbia Mayor Muriel Bowser joined advocates and housing professionals today to open the John and Jill Ker Conway Residence, an architecturally striking apartment building with 60 units of permanent supportive housing for veterans exiting homelessness and 64 affordable and low-income units. The 124-unit mixed income building is among the first of its kind in the country to have full-time, onsite VA case managers. The soaring structure represents an unusual effort to bring outstanding architecture and design to housing for low-income and homeless populations. Community Solutions (CS) supports local communities in solving urgent, complex social problems where the gaps between high costs and poor results for vulnerable people are the greatest. The CS team has more than 20 years of experience in developing permanent supportive housing. 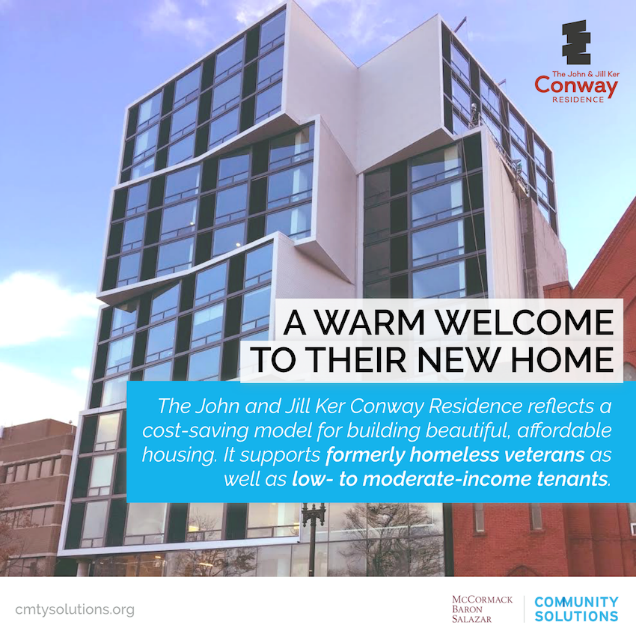 CS coordinated the nationally regarded 100,000 Homes Campaign, which helped 186 communities find housing for 105,000 homeless Americans, including 31,000 veterans. McCormack Baron Salazar is the nation’s leading for-profit developer of economically integrated urban neighborhoods. Since 1973, MBS has been a pioneer in community development and urban revitalization, with 188 projects in 45 cities and more than 20,000 high quality homes for families, children, seniors and veterans.